Tooth-Colored Dental Wax (Pontic Wax) - 10 Pack - New! Tooth-colored dental wax is great for those times when you want to hide or obscure your braces. Soft and pliable, it is slightly more opaque with yellow undertones than regular dental wax to match the natural color of most teeth. 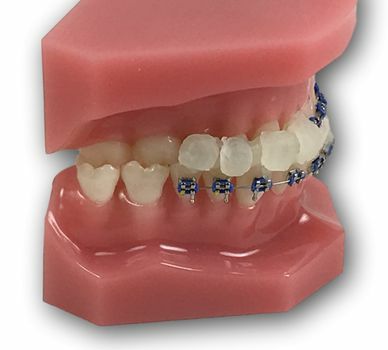 While it won't completely hide your braces, it will make them a lot less noticeable Some dentists call this type of wax "pontic wax" and use it to fill spaces in clear retainers where teeth are missing. This wax is unscented and unflavored. There are 10 containers of dental wax per pack. Each package contains 10 containers of tooth-colored dental wax. Remember to remove the wax before you brush your teeth. We've had a lot of requests for this type of product over the years! There are times when people just want to hide their braces. While this product won't totally hide them, it does help to obscure the shiny metal mouth that some people feel embarrassed to show. would this wax cover up a gap even if i dont have braces in? Thanks for your question, Abosede! Yes, it is sometimes called Pontic Wax, and can be put into a clear aligner to visually "fill in" for a tooth that is missing. However, if you don't have braces or clear aligners, this wax would not stick to teeth. How white or opaque is this wax compared to the wax you would find in local stores? The wax is not totally opaque white. It is more opaque and more white than the average wax you would find in stores. In the dental industry, it is called "pontic wax" and is often used in clear retainers or aligners to visually fill in the space where a tooth is missing. This is a fantastic product to fill gaps in Invisalign. I do theatre and was hoping for something that would help hide my braces for period pieces and of course for comfort. When they arrived I had to get out my standard wax to tell the color difference. It was basically barely less than clear wax, not the off-white that it states. SO I spent $15 on regular wax, something I get from free from my Orthodontist. Merchant Response:We're sorry to hear that you were unhappy with the product. The color of the wax is slightly more opaque than regular dental wax. People's teeth are different shades of off-white, so what matches one person might not match another. ProsIt is your standard wax and does protect my gums from cuts and makes speaking/singing easier. ConsIt is not the color I thought it would be. Much softer and more pliable than the dental wax at the drugstores. The price is great too. Thanks. This stuff is almost the same color as my teeth. It works pretty well to hide my metal braces. It isn't totally white, but it's a little whiter than the regular wax that I use. I wanted some wax that will cover my braces so that they won't be so noticaeble. This wasn't exactly the same color as my teeth but was close enough. It did the job!